Applications for the 2018-19 Care for Our Earth Grants are due November 9, 2018. See news release. Santa Barbara County K-12 teachers are encouraged to apply for Care for Our Earth Grants, through a program that is a collaboration of the District, the Santa Barbara County Education Office, the Santa Barbara County Water Agency, Pacific Gas and Electric Company, and Southern California Gas Company. Grant applications are released in the fall. See more information, including a list of previous recipients and projects, at the County Education Office. The program offers $300 grants to teachers to do environmental service projects with students to save energy, cut traffic and pollution, or save water. See below for links and resources, and contact the District Public Information Officer, Lyz Hoffman, for more information. Congratulations to the Santa Barbara County teachers who were awarded the 2017-2018 Care for Our Earth grants. Examples: Students could measure energy used by particular appliances, and/or identify times when lights are left on or equipment is left plugged in and turned on. Students could review school energy bills, identify potential savings, and make presentations to principals. Students could develop and institute an energy-saving program. Grant funds could be used to purchase measuring equipment, compact fluorescent lights, plug strips, or supplies for charts and presentations, or for field trips or speakers. Traffic Solutions “School Pool” Info: Countywide automated matching to help schools form neighborhood carpools. Examples: Students could look at ways water is used at school or home and come up with ideas for reducing use, such as replacing lawn areas with water wise gardens. Teacher could organize a field trip for students to learn more about conserving water. Students could create tools to educate others, or identify equipment to purchase to reduce water use. See the Water Wise website for more info on conserving water. The District offers countywide classroom presentations for K-12th grades and college classes with lessons on our atmosphere, air pollution, global climate change, and what we can do to make a difference. 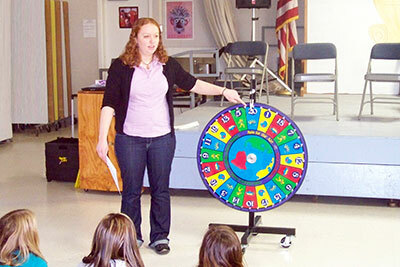 Presentations can be tailored to the particular focus and level of the class, and can include a game using the Wheel of Change (pictured below from District Public Outreach Intern Karly Kaufman). To schedule a presentation, contact the District Public Information Officer, Lyz Hoffman. See more resources on this page. 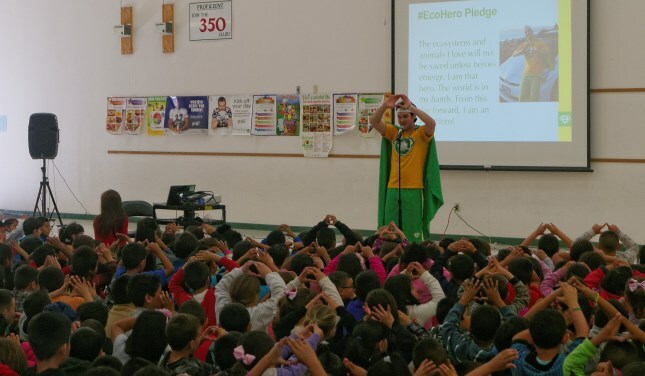 The District sponsored assemblies in some Santa Barbara County schools to bring in Mr. Eco, an environmental rap superhero who teaches elementary school students that they have the power to protect the environment as “EcoHeroes”. 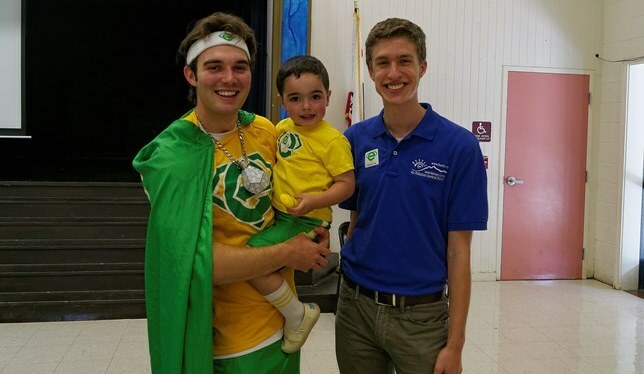 Mr. Eco’s shows are not only educational, but also extremely engaging as students learn environmental song lyrics and dance moves, answer jeopardy questions, and feel empowered to make change in the environment at a young age. For more information and all of Mr. Eco’s videos, visit his website. Students take the EcoHero pledge after learning about protecting ecosystems, wildfire, and clean air. Safe Routes to School discusses efforts to encourage kids to bike or walk to school (or carpool or take the bus). Air Pollutants & Your Health describes the pollutants of greatest concern in Santa Barbara County, and their health effects. Today’s Air Quality provides air quality information for Santa Barbara County. Ozone data shows levels of ground-level ozone measured at county monitoring stations, updated hourly on this website. Toolkit to Reduce Diesel Emissions at Schools provides resources for schools to hear about effects of diesel exhaust pollution, and reduce emissions. Videos are available free in English and Spanish from the California Air Resources Board, click on the title to go to the order page on the state’s website: “A Breath of Air: What Pollution is Doing to Our Children,” and “With Every Breath: Health Effects of Smog”. Lessons and activities for K-12 from Project A.I.R.E. (Air Information Resources for Educators) are available for download (free) from the U.S. Environmental Protection Agency website. Air Pollution: What’s the Solution? activities from the U.S. Environmental Protection Agency curricula help students learn about ground-level ozone. The National Science Teachers Association includes lesson plans and activities to teach air quality concepts – search at NSTA Science Store under the term of interest. The California Air Resources Board website’s Know Zone page includes information on air pollution, lesson plans, and resources for students: www.arb.ca.gov/knowzone/knowzone.htm. For more information on local programs encouraging alternative transportation, see Traffic Solutions’ webpage here: www.trafficsolutions.info. Community events like Earth Day offer an opportunity to showcase environmental education projects. Read more about Earth Day. The CREEC Network (California Regional Environmental Education Community Network) — Information about environmental education resources for teachers, including a Resource Directory for Region 8 (Santa Barbara, San Luis Obispo, Ventura, and Kern Counties). See http://www.creec.org/custom/14.